A serving Senator from Akwa Ibom State, Bassey Albert Akpan, has been detained by the Economic and Financial Crimes Commission over his alleged receipt of vehicles worth N303 million from an oil baron, now standing trial for financial crimes. 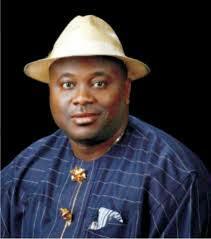 Bassey Albert Senator Akpan, who represents Uyo Senatorial District in the upper legislative chamber, was arrested taken into EFCC custody since Tuesday by operatives of the anti-graft agency. “Yes, he is with us,” Wilson said, but did not give further details of the arrest. He also did not say when the lawmaker would either be charged to court or released on bail. But the arrest, it was gathered, was to enable the lawmaker to state his role in the receipt of exotic vehicles worth N1.1 billion from the promoter of Bay Atlantic Energy and Sahel Energy ahead of the 2015 presidential polls. EFCC contends that the vehicles, which ranged from Mercedes Benz luxury cars to campaign buses and trucks, were acquired with the proceeds of fraud. The report added, “Adamu Mu’azu received vehicles worth N504, 500, 000 including a Benz G63 worth N45m between May and August 2014. “Secondus received vehicles worth N310m. On June 28, 2013, he received a Benz G63 worth N36m; on April 8, 2014, he received two Toyota Hilux vehicles worth N14m.